Mercy Watson books have been checked out of the Columbus Public Library and are now at home with my grandson Charlie, 3 1/2. I’d never heard of the existence of Mercy Watson prior to last week’s Ohio visit. Charlie has always liked his soft pig toy and has a small pig on the kitchen counter where he eats lunch. Seems that ‘buttered toast’ is a favorite of Mercy Watson. 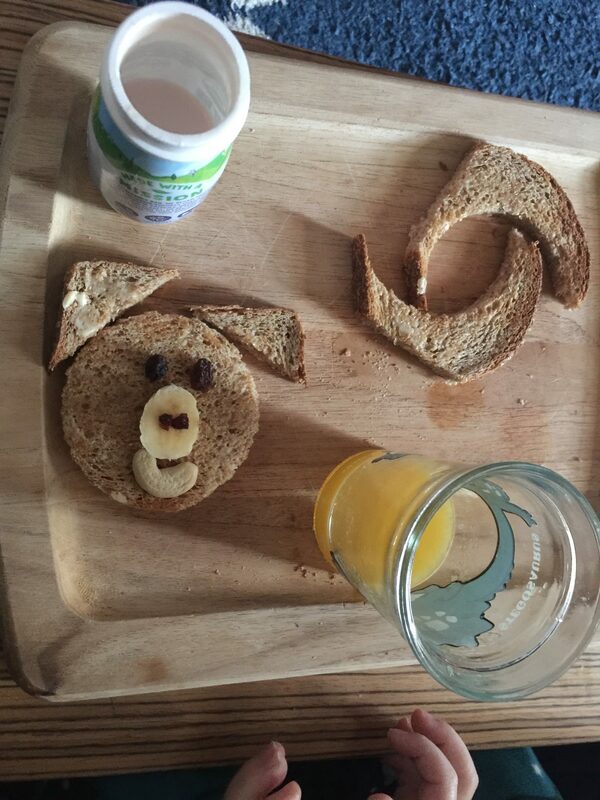 Laura created a Mercy Watson breakfast for Charlie. He was adjusting the mouth/cashew. That is hand squeezed oj accompanying the toast. Mmmmm. I should have taken one more shot of the empty breakfast tray. A pig in my Raisin Bran at breakfast! I was just about to pour on the milk. At first he was lying flat. That’s some big bran flake, I thought. I’m always looking for signs. The family has gathered in to Erika’s parents to celebrate Mark’s birthday. You were a bicentennial baby and my father’s mother knit you a red ,white and blue afghan. This afternoon we went to the farm next door to see how the pigs are growing. We were playing with the runt named P.P. and watching her root in the mud. No truffles found, though. Mark and his sons Michael and Jack were walking back home. Of course I had the fixed lens (50mm) on the camera. I almost missed them though. Erika asked me “Did you get it?” We saw the three of them at the top of the hill at the same time. The next frame they’re in total sunlight and it isn’t as strong. Happy Birthday Mark. I searched the card racks for the right words but the card writers this year didn’t capture what I wanted to say. When I see you grown up, loving your own beautiful family, my heart is full. Sunday afternoon. We’re doing family things. Gathered together for lunch. We had just left the Northstar Cafe on High Street and instead of turning to get on the Interstate, Erika drove north on High Street which was definitely the scenic route. More like snapshot time and a slice of the scene around Columbus. Everything a bit tinted by the van windows shading. Makes the photo quality poor and a bit retro. Two out of the three Erika called! I was too busy looking to see. This is not my usual method of photographing for the blog, subjects and scenes usually just present themselves and I don’t go out to hunt for material. Remember Erika found the men painting the water tower almost a week ago. The pickups stopped at the intersection were first. I shot right through the glass window. The GoodGuys Rod and Custom Association Car show was this weekend in Columbus at the Expo Center. I’d gotten the local Dairy Queen before and I know PIERCE Cleaners was a subject for signage at night time once on the blog. One of my followers and longtime friend Mary Corbett used to say this exact message on the sign at the cleaners. Pig and another American flag. We were at the neighbors’ farm in Hardy, VA this past weekend. They graciously allowed the grandchildren to pet the baby pig and the baby turkeys. The baby mini-mules and their miniature horses don’t have to worry but then again, they have NAMES! Bob the Mule. Heart the Horse. Oh yes, they have a couple of ducks. And their names? Christmas and New Years. The second image? 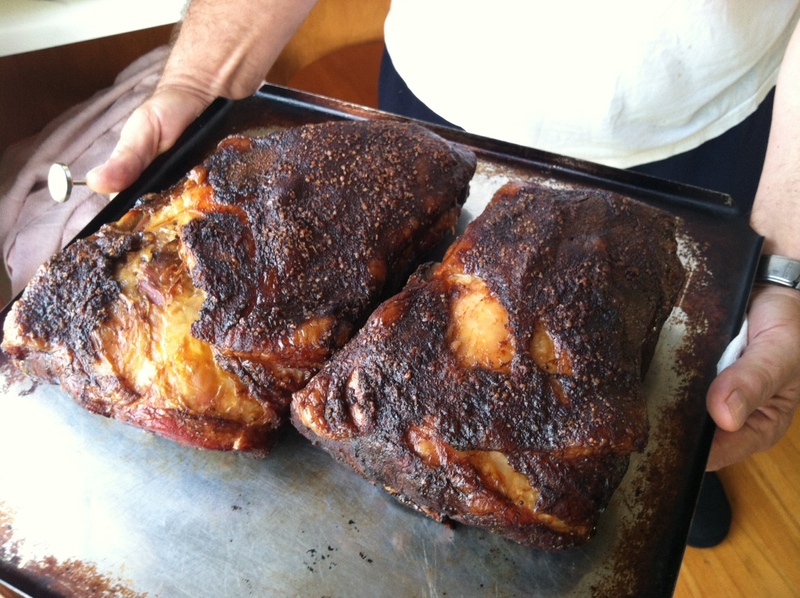 Those are a couple of (seven pounds apiece) pork butts that Pap smoked for the Paleo crowd. The veg branch of the family didn’t come this past weekend. I don’t think the meat had names. Last day of pumpkin season. The Pig Race at Leed’s Farm Ostrander, Ohio. 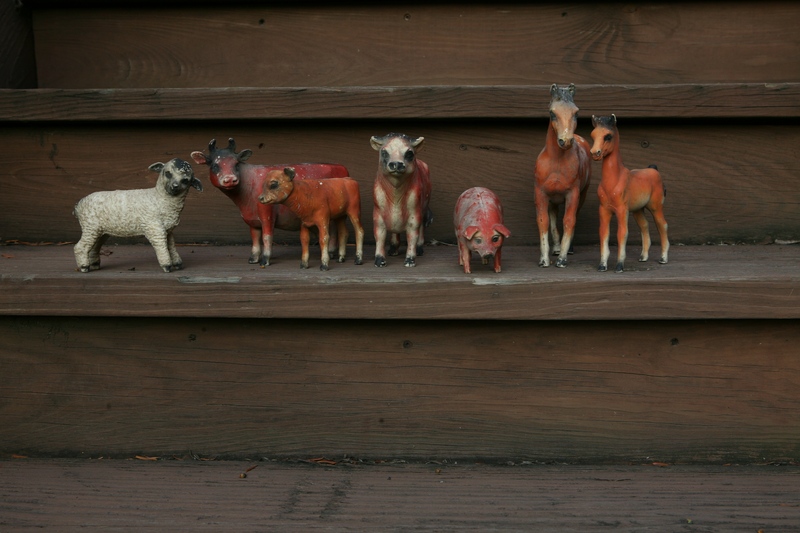 Each pig represented a college football team in the Big Ten. Well, there are now 12 teams in the Big Ten and already a Big Twelve – so 6 pigs..ran three at a time and then a final race between the two winners. The pigs were rewarded with a treat at the end of the race and didn’t seem to mind. Pig races are over in a flash. 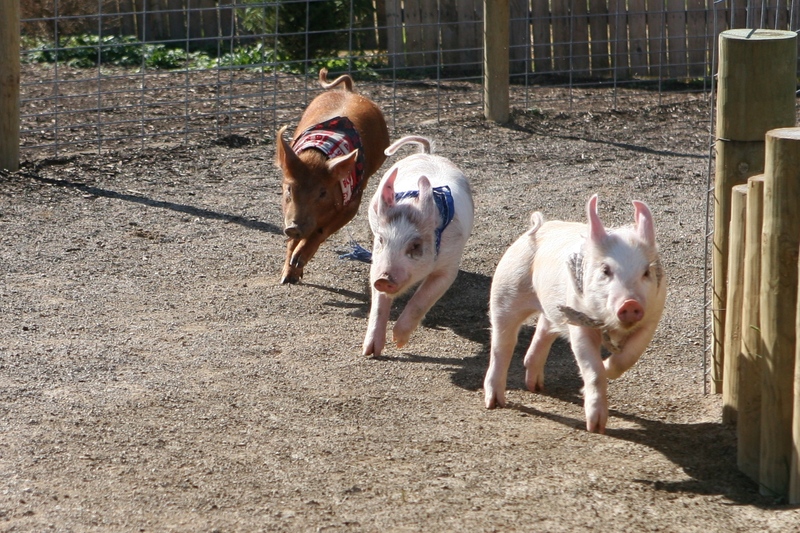 The little pigs run fast! Purchased in 1977 in New York City at Creative Playthings. Rubbery farm animals. Nice to clutch and carry around when you’re almost two. I bought them for baby Mark who’s 34 now. Maybe the paint is unsafe for the grandchildren, plus they have a hole in their stomach so whatever dirt and mold in the basement the past 20 years is living inside them. I put them in the contractor bag to drag to the curb and I swear the cow’s eyes looked at me. I took them out. Photographed them. Their faces have the loveliest expressions.